The past month has seen local and international artists and comickers coming out of the woodwork and banding together on a wonderful project from the Melbourne Comics people. 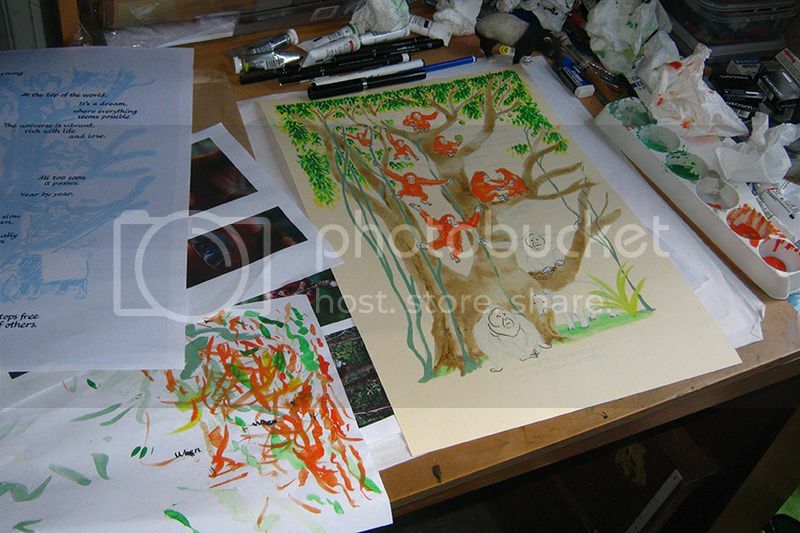 It's a benefit for Project Orangutan, with proceeds of the published book going to Orangutan rehabilitation. There's an Indiegogo campaign running now, with a variety of perks available coming up, including a 32 page colour comic, and a 64 page book, all featuring inspired work about orangs - I'm really hoping you'll support this! I've had some fun with my piece, going back to basics, and creating the artwork on paper using watercolour, gouache, and a little ink and pencil to complete it. The lettering was done on another piece of paper in fountain pen, then scanned in and overlaid in Photoshop. This piece originated in my desk notebook, and I stayed close to my original concept of it. As is typical with my short comics, it's more a philosophical piece than anything particularly didactic (although there is definitely a place for that here, given the parlous state of the last precious wildernesses of South East Asia, due to palm oil, logging and mining). To see the finished piece, you'll need to see the book (or possibly a poster that may also be produced featuring it).